Freies Theater Tempus Fugit was invited by the polish Teatr A for a creative residency for “Stanislaw & Bolesław” coproduction staging in Gliwice. The exchange about one's own working methods, ways of working and contents. This exchange was mediated on the one hand by the intensive joint discussions about religious references, the biblical context, myths and traditions, fundamental aspects which are reflected in the work of both theatre groups and also mark the differences. A central role was also played by the question of the theater's personal responsibility and responsibility towards an audience that can be found in public places, on the street or in other public places, such as churches and cathedrals or schools. 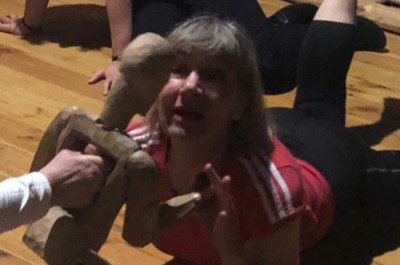 The direct joint theatre work, focused on working with a wooden figure, working with an object. The improvisation work led by Lescek and finally the workshop days for mask work, led by Andrea Brugnera, that deepened the preoccupation with what is available to the actors: the performance, the inner movement, the body, the gesture, the ritual, the surprise, the play – concentrated, together and intense.